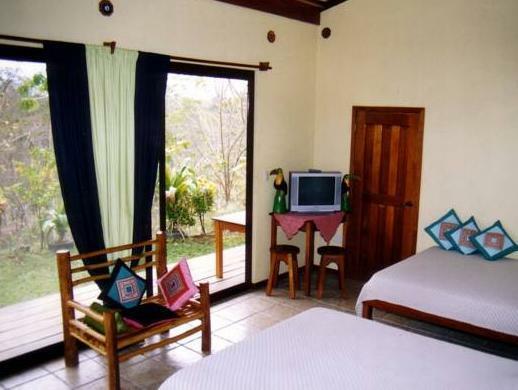 ﻿ Best Price on Fidelito Ranch & Lodge in Tambor + Reviews! Set on a 60 hectars farm in the spectacular Tambor Hills, Fidelito Ranch and Lodge offers accommodations surrounded by private gardens, tropical forest and small streams. Free Wi-Fi and free private parking are included. The rooms are decorated with a rustic style, feature seating and dining areas and an equipped kitchenette with fridge and coffee maker. The bathroom is private, comes with a shower, and offers a hairdryer and free toiletries. The on-site restaurant serves local dishes, seafood meals, pastas and pizzas for breakfast and dinner. Special diet menus are possible under request. Fidelito Ranch & Lodge can help arrange activities such as snorkeling, diving, sport fishing and boat trips on the nearby River Panica. Hiking and horse riding are popular in the surrounding hills. From July to November: whale watching tours, in the area of Playa Tambor Tambor Beach is 1.9 mi from the property and Tambor Airport is 10 minutes’ drive away. The bus station can be reached in 15 minutes by car. Please note that the first night of the reservation must be paid in advance. Once a booking has been made, Fidelito Ranch & Lodge will contact the guest directly to arrange payment by bank transfer or Pay Pal. Please note use of the air conditioning costs USD 10 per day. Please inform Fidelito Ranch & Lodge of your expected arrival time in advance. You can use the Special Requests box when booking, or contact the property directly using the contact details in your confirmation.